As more and more plastic grocery bags are being replaced by cloth totes, why not turn your leftover plastic bags into a reusable crocheted bag? 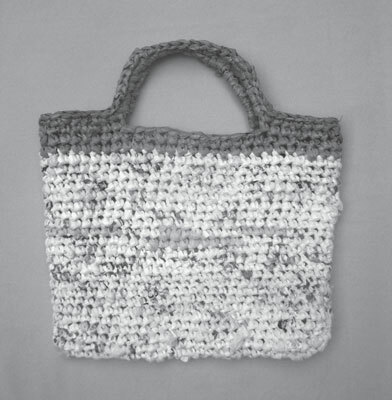 Plastic bags can be crocheted like yarn; they just need a little bit of prep work to become plastic yarn, or plarn. If you don’t have enough plastic bags to make the bag shown here, ask around and help relieve your neighbors of their unwanted bags. You can create a reusable tote made with loops of plastic. Gauge: 9 sc and 10 rows = 4 in. The directions here are written in Crochetese. Gauge isn’t crucial with this project, so feel free to adjust the hook size so you’re crocheting comfortably with the plastic yarn. All you need to prepare your plastic grocery bag strips is a pair of long, sharp scissors and a trash bag for unwanted ends. Be warned, though, that cutting so many bags is a little time consuming. Why not alleviate the tediousness by cutting bags and getting caught up with your favorite TV shows at the same time? Lay a plastic bag flat, fold it in half lengthwise so that the handles are at one end, and then fold it in half lengthwise again. Cut off the top and bottom of the bag, removing the handles and bottom seam. Cut the remainder of the bag in 1-1/2- to 2-inch pieces widthwise for the loops. Repeat for the remaining plastic bags. Holding two loops, pull the end of one loop halfway through the open center of the other loop. Continue to pull the end of the first loop through the opposite end of its own loop and pull to make a knot. At this point, the end of the second loop should be secured inside the knot. 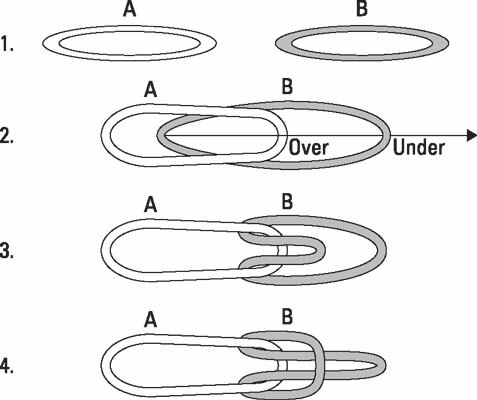 Take another free loop and pull it halfway through the open center of one of the joined loops; continue to pull the end through the opposite end of its own loop and pull to make a knot. Joining loops of plastic to make plarn. Repeat Step 3 for all plastic bag loops to make one long, double-thick strand of plarn. Wind the plarn into a ball. Rnd 1: 3 sc in second ch from hook, sc in each ch across to last ch, 3 sc in last ch. Working across opposite side of foundation chain, sc in each ch across to first sc, sl st in first sc to join (56 sc). Rnd 2: Ch 1, sc in each st around, don’t join to first sc. Continue to work in sc around the bag in a spiral fashion without joining or turning at the end of each rnd. Work in sc until the bag is 10 in. long. Lay the bag flat. Find the center front of the bag and place a stitch marker on either side of the center 12 sts. Mark the center 12 sts on the back to coincide with the front. There should be 16 sts between each center group of 12 sts. Continue to work around in sc to the first stitch marker. Ch 12, skip 10 sts, sc in next marked stitch, sc in each st around to the next marker, ch 12, skip 10 sts, sc in the next marked stitch. * Continue to sc in each st around to first ch-12. Work 20 sc in ch-12 sp; * rep from * to * around. Sc in next 8 sts, sl st in next st. Fasten off and weave in the loose ends with your hook.